Hi there! I'm Andrew. Thanks for taking the time to visit my site. 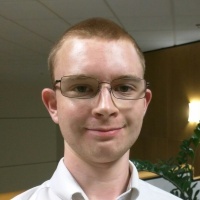 I am a student at the University of Missouri - St. Louis, studying Computer Science and Mathematics. I enjoy writing code, learning about new technologies, tinkering with electronics, reading, and thinking about the future. I first began learning how to code in high school. I had received a Lego Robot as a gift one year, and decided that I wanted to learn how to program it. I discovered the leJOS project, and decided that I would use that framework to program my robot. I had never written any code before, and my school did not offer any Computer Science courses, since it was in a small, rural town. So I had to learn everything on my own, via the internet and books. As such, it took awhile to even get around to writing code for my robot, as I had to learn all of the basics of Java - and coding in general - first. But when I finally was able to write code that made my robot move, I felt very empowered. It was quite exhilarating to have taught myself a new skill. and to now be able to write code that effected actual change in the world. My coding abilities have grown significantly since then. I enjoy learning new programming languages, and becoming more proficient in them. I am also very interested in Artificial Intelligence and Machine Learning. It is a very important area of technology that has had a significant impact on our lives, and will continue to do so in the future. I have contributed to the HTM.Java codebase - which is an open source machine learning library licensed by Numenta. I am looking forward to learning more about neural networks, and other machine learning technologies and algorithms. I've worked at Tapestry Solutions as a Software Tester, where I learned a lot about software quality, testing techniques, and deployment cycles & releases. I was a participant in the GlobalHack VI hackathon, whose goal was to help alleviate homelessness. My team and I built a tool that allows homeless shelters to quickly locate and assist the homeless. I like to learn about new technologies, and I think that one of the best ways to do that is to share what I have learned. After all, it has been said that you do not truly know or understand something until you can teach it to others. As such, I maintain a blog where I discuss things I have learned and done, and write tutorials so others can do those things as well. NoidMAT is a Minecraft mod that I developed using the Forge modding framework. It allows users to write simple scripts in Java to automate their Minecraft avatar's actions. I created a webpage for it here which contains more details. I learned a lot while developing the mod, especially about loading and executing code dynamically, creating a user friendly API, and concurrent programming. MERP is a result of my continued interest in robots and electronics. It is a robot I created with an Arduino and Raspberry Pi that can be remote controlled over WiFi via a PC or Android device. JRPiCam is a Java API that allows users to access the camera on their Raspberry Pi board with Java. I created it because I had purchased a Raspberry Pi Cam, and quickly noticed that there was no Java API for it. So I made one myself, and documented it for use by others. Picasso is a side scrolling desktop game I created with JavaFX. I was learning about JavaFX for the first time, and decided that making a game would be an interesting way to put my knowledge into practice. I have posted a video of it on YouTube as well. One interesting thing to note about it is that I chose not to use any existing game frameworks, and relied only on the standard Java & JavaFX libraries to create Picasso. Thanks again for visiting my webpage! I hope your time here was well spent. Please feel free to reach out to me via email, or to connect with me on LinkedIn. I am always interested in talking, answering questions, or discussing new opportunities!